Image: Tents of hunger striking asylum seekers at the border. 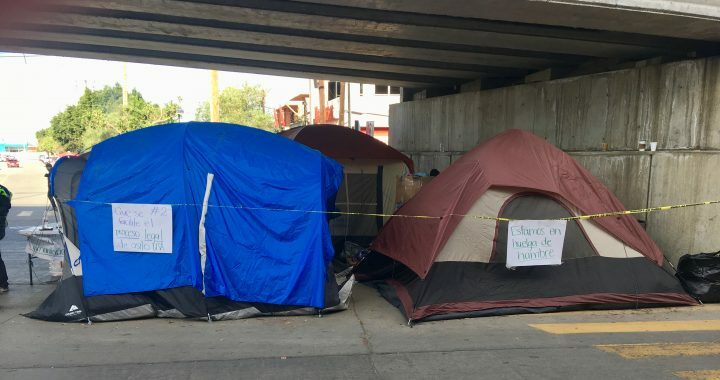 The tent on the left reads one of their demands, “#2: Que se facilite el proceso legal del asilo USA / #2: That the legal process for US asylum be facilitated.” The tent on the right reads, “Estamos en huelga de hambre / We are on a hunger strike” (Photo: Traci Yoder). The car ride from the San Diego airport to the US-Mexico is a brief 20 minutes. As I approached the border we passed a large high-end mall at around 11pm. The taxi left me outside a Coffee Bean and Tea Leaf. I spotted a Carl’s Jr. lit up against a backdrop of border fence. I walked into Mexico. The guard barely glanced down at the passport in my hand. Border fences look similar from Palestine to San Diego. The unnatural machinery of it all; the buildings, gates, and sounds look similar as well. I’ve been to and through lots of borders. The infrastructure of inequality of the physical and social architecture of all borders are not surprising. But they are always jarring. I knew on the other side of the gates, cameras, and fences were thousands of people fleeing from impossible situations. They had traveled on foot with little to nothing for thousands of miles. Now they needed to get just a mile or so more. After traveling from New York, I began my first day on the ground in Tijuana at the daily legal meeting to coordinate. There I met tired but amazing organizers and lawyers and legal workers going non-stop to triage the legal needs of these immigrants. Some are living and working down here in Tijuana. But many, like myself, are here to lend a temporary hand. As much as the immigrants need food, clothes, shelter, and medical care, I have heard over and over in the last few days that they want to know their legal options. They want to know about the process. Trying to meet that legal need under these grossly inadequate materials conditions is a challenge. Every morning I’ve headed to the border crossing where some migrants gather every morning to see if they can cross. There I’ve been monitoring police activity, and how many migrants are called out to present themselves to the US. This is where the small, but dedicated group of Legal Observers begin the morning. Over my few days I’ve gotten to know the “system” at the border. We are from all over the US, and some are from Tijuana. It’s definitely a bit different than Legal Observing in the US, but we have our green hats and we know what to do. As thousands of migrants are bottlenecked here in Tijuana they are staying in an open air sports stadium. The weather is much colder than I expected, especially at night. A stadium has been transformed into a makeshift camp. Some people have tents. Most have built shelters from what they can find. There are children sleeping under little more than tarps. Other people are living in shelters throughout Tijuana. The conditions are bad, and getting worse every day. Moreover, it rained last night, and more rain is on the way. Many sleep in the open air. Most immediately many people need urgent humanitarian relief. The situation is untenable; many believe it was made intentionally so. I came down here to Tijuana hoping I could help, mostly intending to Legal Observe. But in the short time I’m able to be here, I have ended up doing anything I can to be useful. Last night I found myself at a large Mexican mall buying as many tents as a $300 donation would get us. I’ve done legal clinics, but I’ve also sorted clothes. There are people from everywhere. There are many internally displaced people from Mexico. I met a Kurdish man from Turkey, and a large group of folks from Cameroon. No matter where they are from, or where they’ve found temporary shelter they bring with them stories of fleeing horrible situations, and hope for the future. Posted in News, NLG Blog and tagged Asylum, Central America, human rights, Immigration, Legal Observers, LGBTQ.